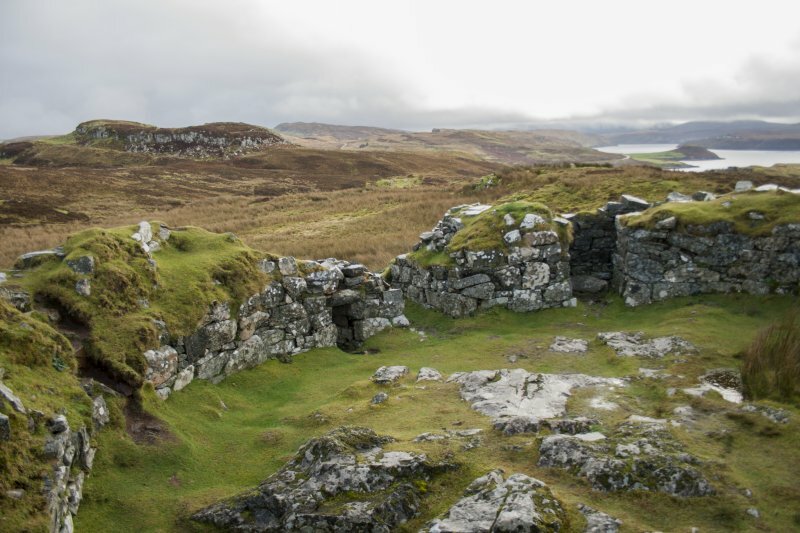 Broch, Dun Beag, Struanmore, Skye. 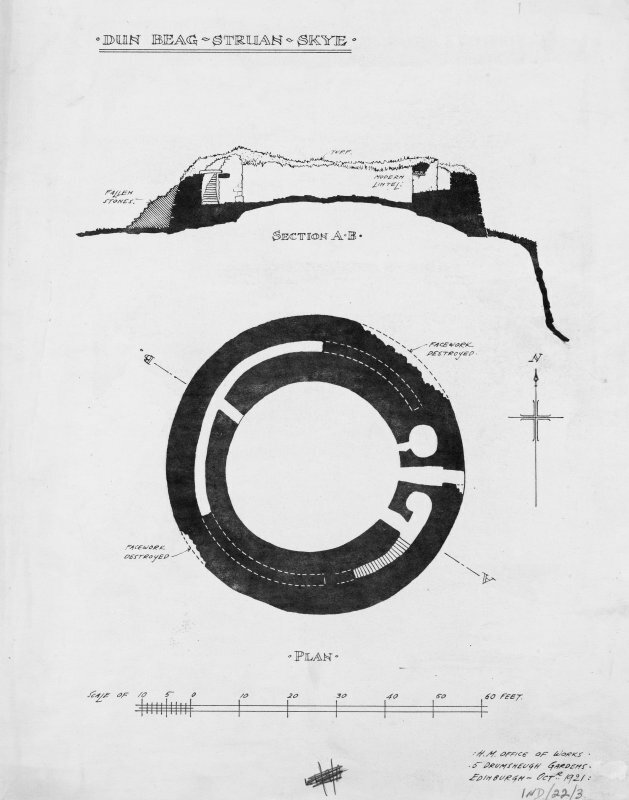 Publication drawing; plan of Dun Beag, Struan. Broch, Dun Beag, Struanmore, Skye. Entrance to gallery. 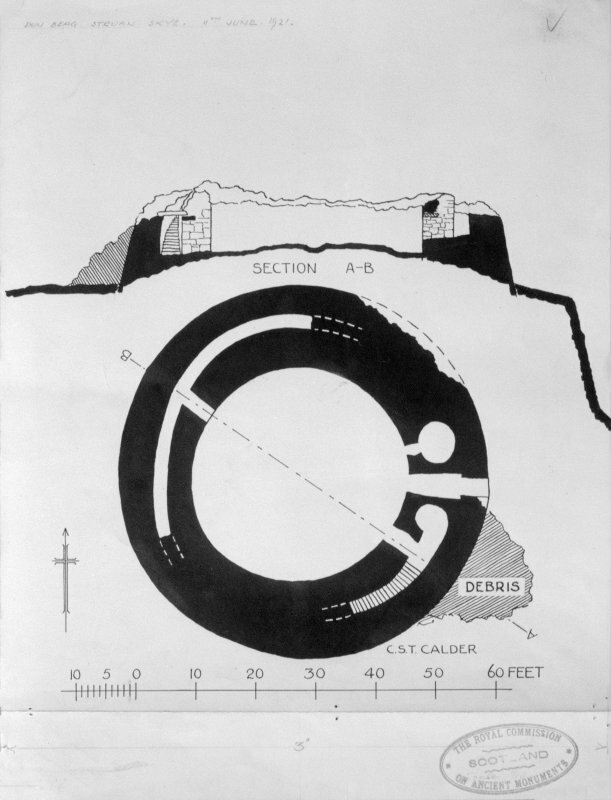 Publication drawing; plan and section of Dun Beag, Struan. Broch, Dun Beag, Struanmore, Skye. The entrance. 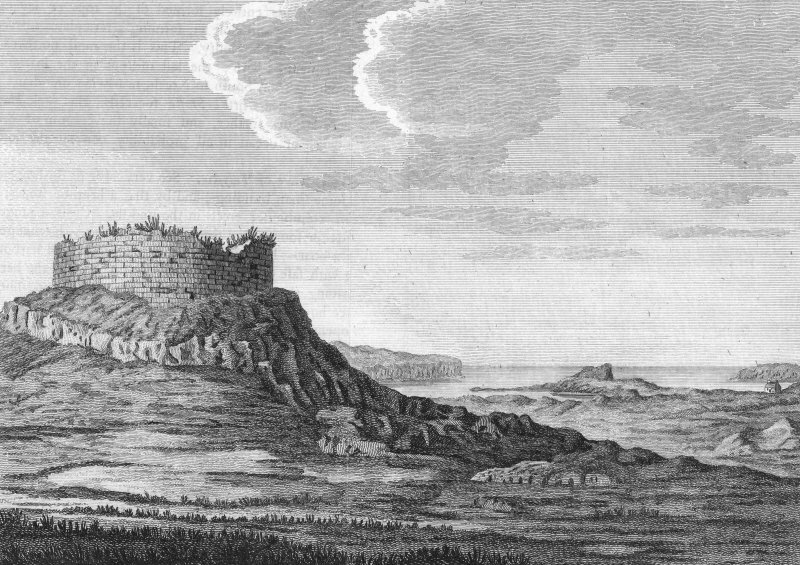 Engraving of views of Dun Beag. From T Pennant, 'A Tour in Scotland, 1769', pl.xxxvi. 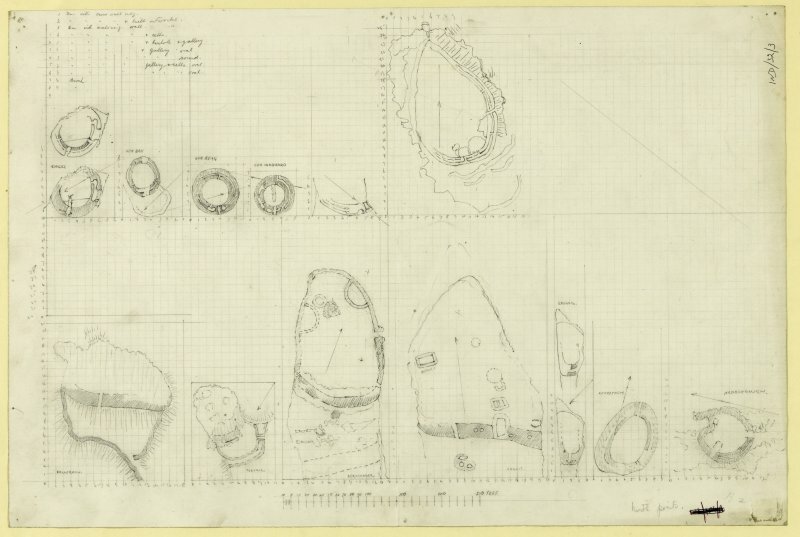 Survey drawing (plan and section) of Dun Beag, Struan. 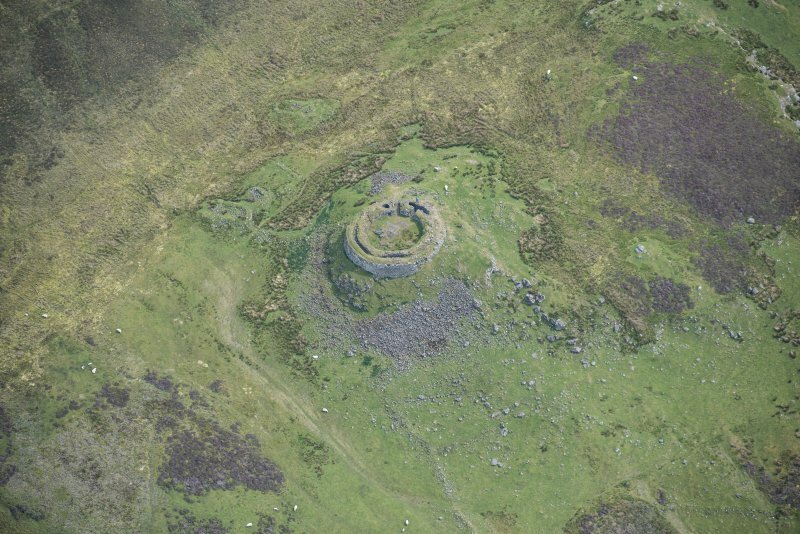 Dun Beag, late first millennium bc Iron Age broch showing evidence of reuse in the early medieval period; excavated 1914 -20. Skye's answer to Dun Carloway, with gallery, cell and stairway surviving between inner and outer battered drystone walls. 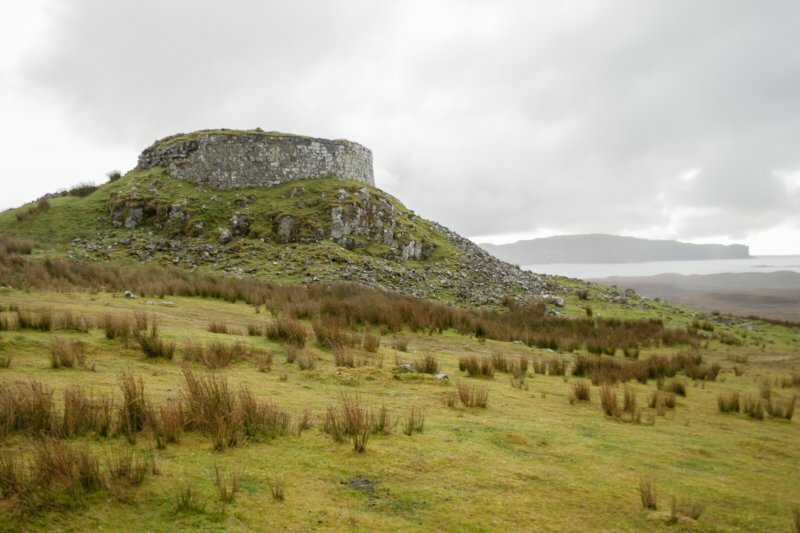 Dun Beag is a broch near Struan and is situated at the N end of a small rocky eminence about 200ft above sea level. Access to it is from the S as for more than half its diameter on the N side it is within 4ft of the rocky edge. 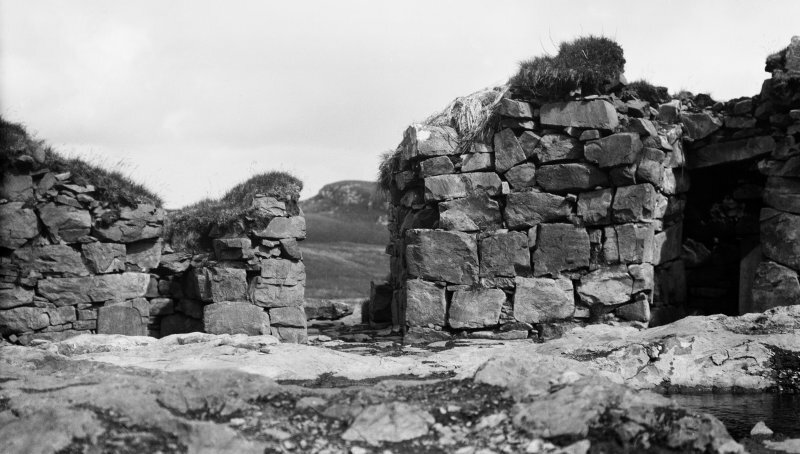 The broch was excavated from 1914 to 1920 by Countess Vincent Baillet de Latour, FSA Scot. The inner court is circular and the diameter is 35ft. The outside diameter is about 60ft. The doorway faces slightly S of E, just where the wall curves inwards from the edge of the plateau. In the interior, 16ft of wall facing SW was found in the NE sector, and a network of drains at various levels. These seem to be of later date as nearly all the finds were at the lowest levels. Structures described by Pennent (Pennent 1776) and Dr. Johnson, (see R W Chapman 1924) in 1772 or 1773, in the centre, were evidently of a later date and have disappeared. As no definite layers of occupation were encountered, it is possible that the broch was used until comparatively recently. The erection and disappearance of these later buildings, sweeping away previous secondary buildings, seems to bear this out, as does the discovery of coins of Henry II, Edward I, James VI (Scots), George II and George III. Other finds included many stone implements and utensils, a gold ring, bronze objects, a piece of folded sheet lead, iron and glass objects, a borer of bone, a pick made from an antler, much pottery and a stone cup. An armlet of glass covered with vitreous paste of different colours is similar to examples found in the lowest levels of Traprain Law (NT57SE 1) dated to probably about 100 AD. A complete crucible is almost identical with one found in the group of earth-houses at Foshigarry, N Uist. The character of the ornamentation of a bronze buckle is more Scandinavian than Celtic and gold rings similar to the one found here have been found with Viking remains. Considerable quantities of cattle and sheep bones were found and a cake of carbonised seeds, probably either oats or rye. Several hundred glass beads found cannot be considered prehistoric relics. T Pennant 1776; J G Callender 1921; R W Chapman 1924; RCAHMS 1928; A Graham 1949. 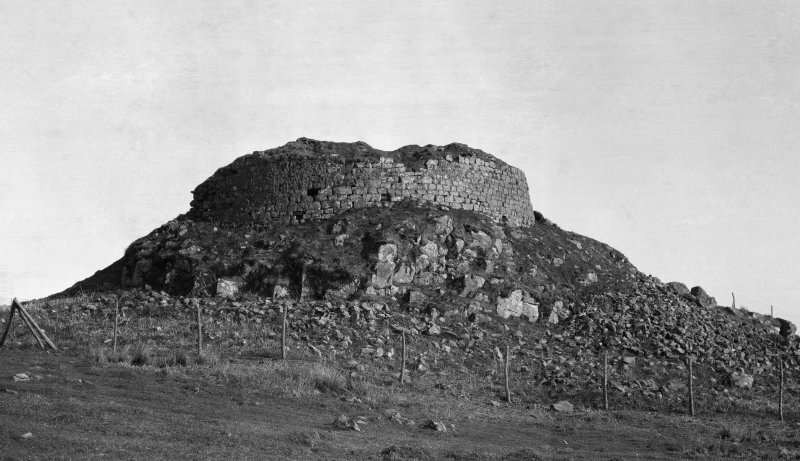 Broch as described by Callender. Condition good. There are about 6 ruined houses to the N and E.
Visited by OS (C F W) 10 April 1961. 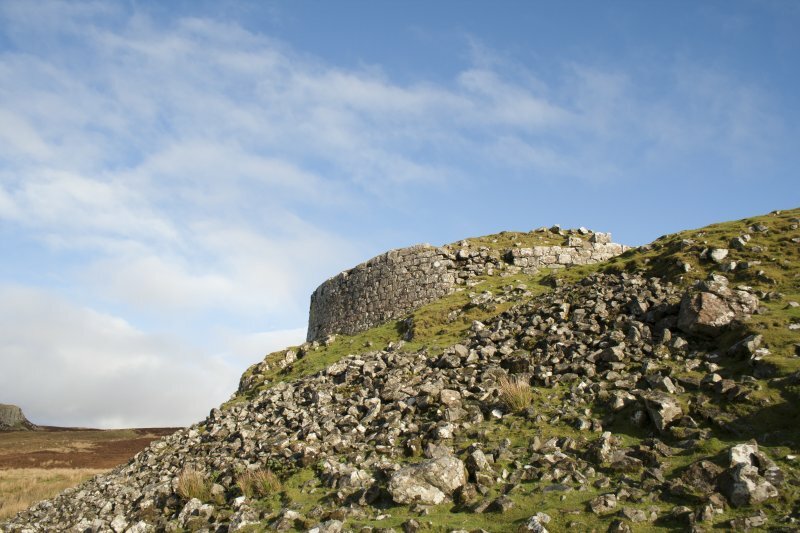 This ground-galleried broch in Bracadale, Skye, stands in a commanding position, on a steep-sided rock knoll on relatively low, undulating moorland (visited 20/4/63, in 1985 and in 2003); it is only about 200m from the old road from which it could be clearly seen and it overlooks the sea and tracts of agricultural land. 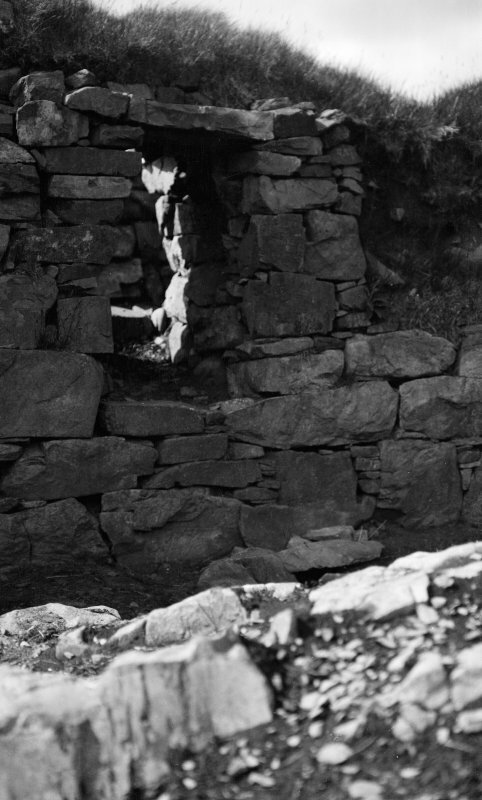 The broch was excavated by the Countess Vincent Baillet de Latour and the work lasted from 1914 until 1920. Although the standard of recording and publication was low even for that date a careful search seems to have been made for finds even though these could not be related to any site stratigraphy. Some 200 tons of earth and stones were removed from the broch and all the soil was sifted through the excavators' fingers. Also the Countess evidently hoped to discover a sequence of floor levels inside (see “The excavations” below). "Within are the vestiges of five apartments, one in the centre" (presumably the central court) "four around; the walls are eighteen feet high." [2, 202 and pl. xxxvi] (vol. 1, Illus. 3.5). 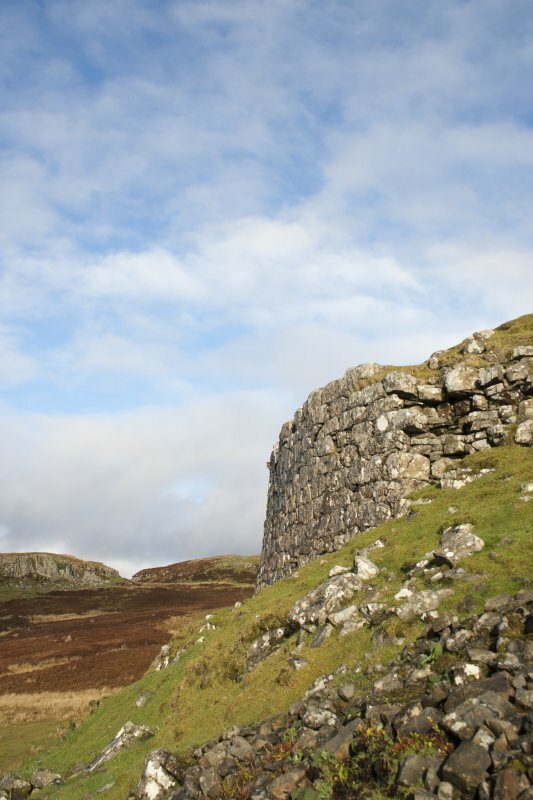 However in the following year a broch near Ullinish – which must be Dun Beag – was visited by Dr Samuel Johnson and James Boswell and the former described the wall as having a height of only 9 feet (2.75m) [3, 64]. The discrepancy illustrates how difficult it is to rely on the measurements of 18th century travellers who rarely say whether they were making estimates of dimensions by eye or whether they carried a tape measure. In fact the figure given by Pennant (who seems to have carried a tape) seems to match his drawing which shows the maximum wall height as about a third of the total diameter 18.6m (61 ft) in places, that is about 6.1m (20 ft). Even if one makes allowances for the tendency of early illustrators to exaggerate the vertical scale, a height of at least 3.67-4.58m (12-15 ft) in 1772 seems indicated. 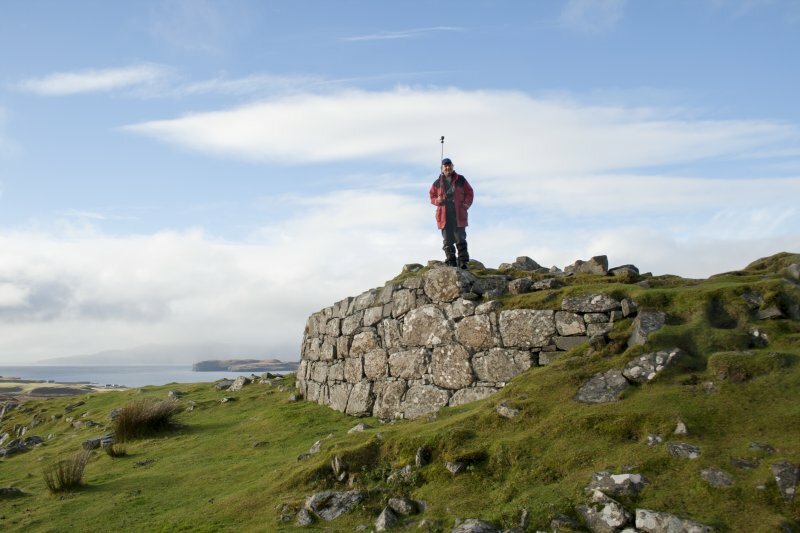 Since the wall is now not much above 1.83m [6 ft) high it is clear that the broch has lost at least a half of its wall height during the last 230 years. This must mean that Dun Beag was once a true broch tower, with at least one upper intra-mural gallery, and probably at least part of a second, still remaining in 1772. By 1985 the wallhead had been turfed over by the then Scottish Development Department (now Historic Scotland)which has also erected a notice. By 2003 there was an excellent path to the site from a convenient parking place on the main road. The outer face is exceptionally well built of rectangular and square blocks of stone skilfully fitted together with the minimum of pinning. 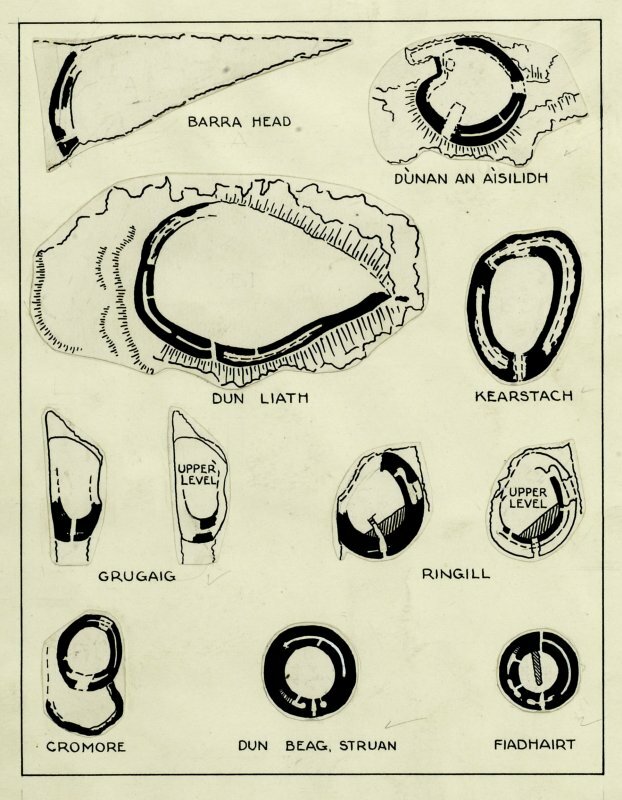 This kind of care in selecting and fitting facing stones is extremely unusual in brochs outside the sandstone areas of Caithness and Orkney and suggests a particularly high status site. The outer face also shows a marked batter. Where it has fallen away the rubble core can be seen and this too seems to have been unusually well and carefully laid; there are few signs of this core collapsing outwards. Level 1: the entrance, on the east-south-east, faces the edge of the knoll and is difficult to get into; it is 3.91m (13 ft) in length and 91cm (3 ft) wide at the outer end where there is a large threshold stone. A door-frame formed of built rebates or checks is at 4.33m (4 ft 5in) from the exterior; the rebates are 17.5 and 20.0cm (7 and 8in) deep. The passage then expands to 1.28m (4 ft 3in), decreasing again to 90cm (3 ft) at the inner end. No bar-holes are now visible and there are no guard cells. 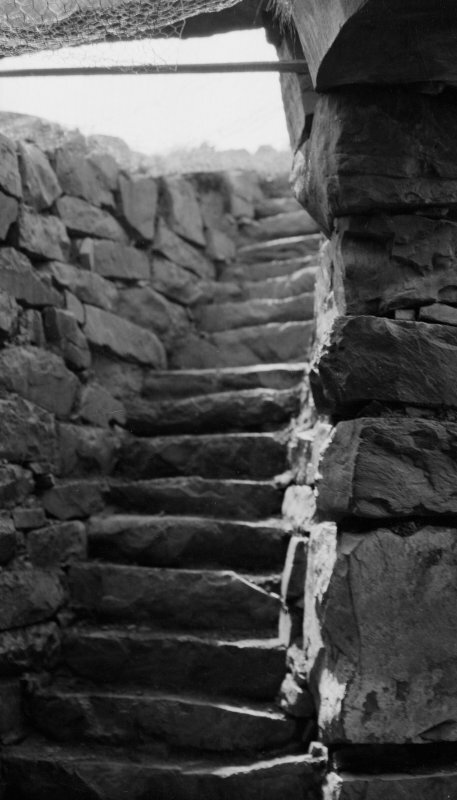 The passage is paved with stone slabs. As noted above, the passage seems to have retained its roofing lintels until about the mid 19th century ; in 1772 Samuel Johnson noted that "the entrance is covered with flat stones and is narrow." 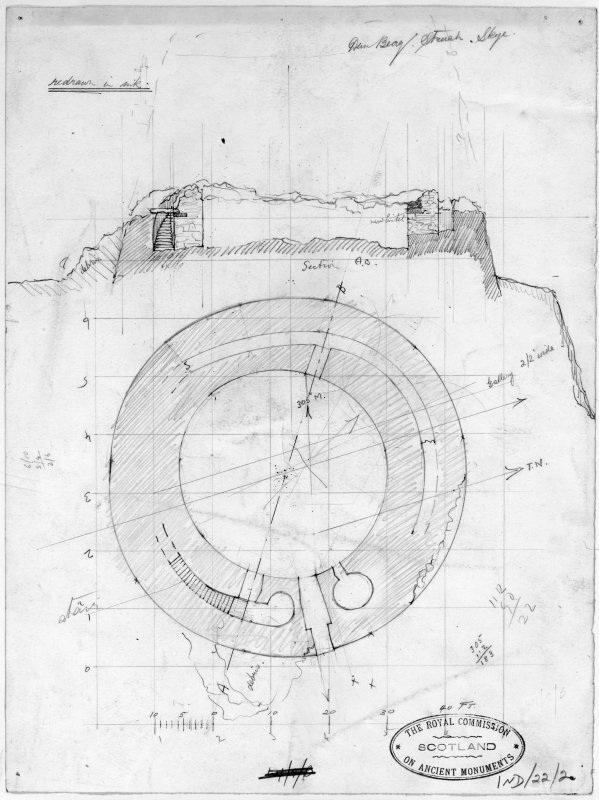 The central court is clear of debris and very nearly circular [4, 113], having a diameter of 10.78m (35 ft 4in); there is a large, rather uneven area of rock outcrop in the middle [9, 883, plan] and Swanson points out that this feature implies the existence of a level, raised wooden floor [9, 881]. On the other hand the high level of the sill of the gallery door at 1.30 o'clock (below) could suggest that the primary floor of the interior was made up to this height, which is also about the height of the top of the rock outcrop; presumably there would then have been steps up to it from the entrance passage. The excavators could well have removed such floor packing without recognising its significance. No trace of a scarcement was observed by the author on the inner wallface which nowhere now stands more than about 1.8m high. Swanson however says that a fragment of it is still visible on the south-west arc, its width being about 40 cm. She also refers to the remains of a raised door at about 1.30 o'clock which leads into the gallery at about scarcement level (which would therefore have been in Level 2), but may be confusing this with the (now buried) raised gallery door in Level 1 at the same point (below). At 5.30 o'clock there is a round mural cell in the position of a guard cell but with its door leading into the central court. On the opposite side of the entrance, at just beyond 7 o'clock, is the doorway to the intra-mural stair which rises to the right; a stair-foot guard cell opens to the left. Both these cells are round-ended with traces of a corbelled beehive roof, but both have lost most of their domes. When first exposed the stair had 21 steps rising 2.4m (8 ft) over 3.3m (11 ft), that is at an angle of 36 degrees; 13 steps are visible now. The average height of the risers is 10cm (4.5in) and the average width of the steps 15cm (6in). There are now only 13 steps. On the opposite side of the court, at about 1 o'clock, is the slightly raised doorway to the mural gallery; the latter appears to run right round the wall from below the stair at 8 o'clock as far as the cell at 5 o'clock. When first exposed the doorway was carefully blocked with good masonry (see Dun Ardtreck – NG33 1). The raised sill of this door is level with the rocky outcrop in the central court but is 73cm (2 ft 5in) above the floor of the gallery. The opening is now hidden under debris. The gallery itself varies in width from 60 - 75cm (2-2.5 ft) and its walls remain standing to a height of 1.35m (4 ft 6 in). It was not completely cleared by the excavators at either end for fear of collapse. At present (2003) it is about half full of debris and the irregular surface formed by this is turfed. Levels 2 and 3: there may be traces of an upper gallery at about 5 o'clock, at a height of about 2.15m (7 ft) above the floor, but no flooring lintels can be seen. As noted the 18th century records imply that at least one and perhaps two upper galleries were preserved in 1772 but no details of these can be recovered. Before the Countess' excavations began there were 1.2 - 1.8m (4 - 6 ft) of debris inside the broch, the cells and entrance passage. It was hoped that distinct occupation levels would be found inside the building, especially near the floor . However the interior had evidently been much disturbed in later times; regular networks of stone-built drains were found at all levels in the fill in which there were also many layers of red peat ash. A crude secondary wall, faced on only one side, was found in the north-east sector; the core of this included deposits of ash and sherds implying that the debris round about was used to build it. The mural gallery was full of earth with many animal bones. In the 18th century there were evidently traces of round stone structures in the central court [2, 3] and these doubtless belong to one of these later periods of occupation. The south part of the central court had a pavement of slabs which evened off the floor to the level of the rock outcrop. 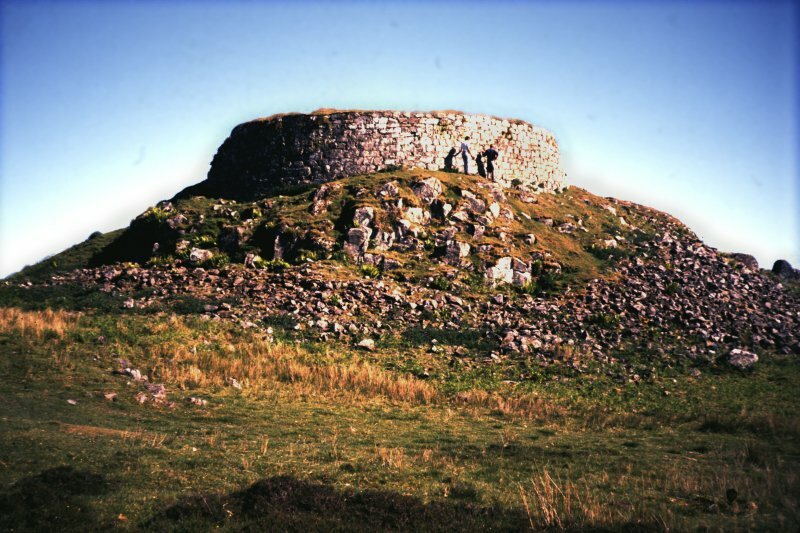 The information from the excavation of this broch is not detailed enough to allow any confident inferences about whether the broch had a primary and a secondary occupation, or whether the high, hollow wall was largely pulled down at some stage. These possibilities do exist, but mainly because of evidence from other sites. The fact that the interior seems to have been comprehensively disturbed in later times probably means that any internal stratigraphy had already been destroyed. One clue may be relevant however; the gallery door was carefully blocked with walling when it was found. This almost certainly means that – as at Dun Ardtreck (NG33 2) – the upper walls of the broch were pulled down at some stage, filling the lowest gallery with rubble which was retained by this blocking. Using this one small clue, and evidence from other better excavated sites, could infer that some of the Iron Age pottery and relics found in Dun Beag belong to a secondary phase of occupation, probably a fter part of the upper wall of what is assumed to have been a tower had been pulled down; the fill of earth and bone refuse in the mural gallery also suggests this. However the Iron Age pottery forms a homogeneous collection so – even though some of it apparently came from under paving at a low level – it cannot be used by itself to suggest an earlier and a later occupation. 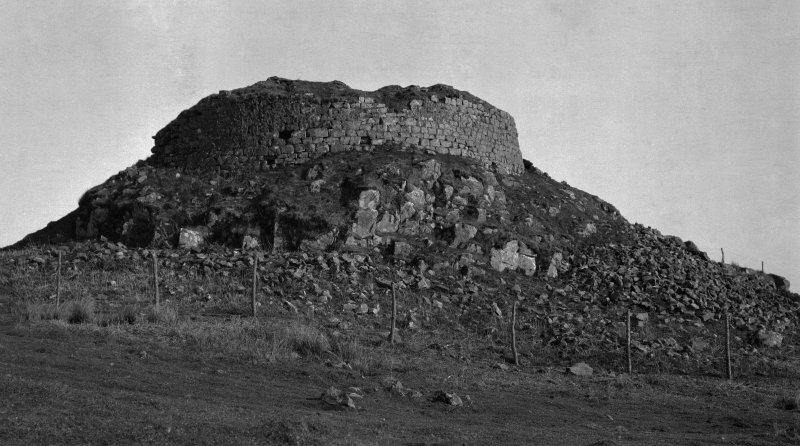 It is also obvious that a variety of later occupations took place inside the ruined broch, perhaps during the Norse period [10, fig. 45, no. 15] and certainly during historic times. Most of the Iron Age pottery and nearly all the other ancient relics were found at the lowest level inside the broch, sometimes under the paving. By contrast there were many fragments of craggans, a relatively recent pottery style, at various higher levels of the central court. There was an almost complete absence of horn and bone tools. Iron implements included fragments of slag, 1 tanged knife 12cm (4.75 in) long, and a possible spearhead 8cm (3.25 in) long. Copper alloy included 2 rings, 1 thin, oval, penannular wire ring (possibly from a loose-ring-headed pin), and 4 bronze pins. There were also several crucibles, round or conical of which only 1 was complete, and some stone moulds (below). Gold: 1 flattened ring was found about 91cm (3 ft) high in the debris, and there was also 1 small strip. Lead: a small piece of sheet lead was found (if ancient this should indicate some kind of Roman contact). Bone and antler: the only bone tools were 1 wedge-shaped awl or borer and 1 pick of red deer antler with all the tines cut off. Stone artifacts included about 20 hammerstones, 2 whetstones, 1 thin polished disc (the upper side polished), 1 ground disc of dark micaceous stone (both faces and edges ground: diameter 8.5cm); 1 rough disc (diameter 8.2cm), probably a pot-lid, 1 handled cup of steatite, 8 grooved pebble strike-a-lights with signs of use with iron strikers, 10 whorls, several of steatite, 1 ball 3.8cm in diameter with a deep hole 7 mm in diameter drilled into it, 1 pear-shaped pendant, 10 fragmentary upper and lower stones of rotary querns, 1 miniature rotary quern, 3 moulds for casting bronze bars or ingots (one cut into a rotary quern fragment), and several pumice fragments, one with sharpening grooves. Glass objects included several hundred globular beads, some plain and others in various shades of blue, amber, red, green and white; they were not thought to be prehistoric though, oddly, most were found near the bottom of the debris inside the broch. There were several other beads including two – dark and milky-blue respectively – with inlays of white and yellow respectively; 1 armlet fragment of Iron Age type was found at the lowest level, D-shaped in section and made of translucent green glass with an external coat of opaque milky white and inlaid with three narrow bands of yellow. Pottery: the Iron Age pottery from this site has recently been discussed by MacSween  but the absence of any except the most general stratigraphical information inhibits any useful interpret-ation unless the evidence from other sites is considered. MacSween's analysis is hampered by her not considering the evidence of the long and reasonably well dated ceramic sequence from Dun Mor Vaul, Tiree, published twenty-nine years earlier (site NM04 4: MacKie 1965a and 1974). It consists of a mixture of plain and decorated wares, the latter mostly having patterns of incised lines and looking like Vaul ware vases. One or two cordoned sherds, and at least one rim, of Everted Rim ware are present. A complete base sherd shows a pattern of finger-impressions on the inside surface. The plain ware appears mainly to be of Vaul ware vases but one unusual fine, barrel-shaped vessel is present. 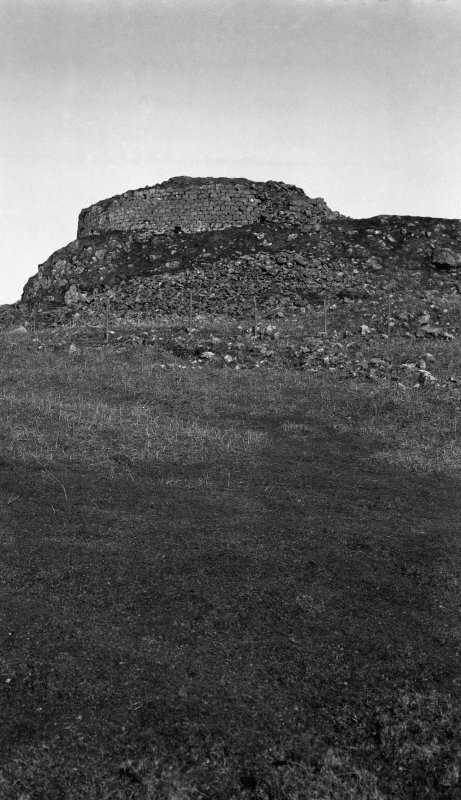 External diameter c. 18.61m (61 ft), internal 10.68m (35 ft 0in), very close to the 1971 survey figure given below; the wall base varies from 3.66 - 4.17m (12 ft -13 ft 8in) and the wall proportion is therefore c. 42.5%. In 1971 an angle and distance survey of the inner wallface was undertaken with a theodolite and steel tape. The central court proved to be very close to an exact circle [4, 113] with a radius of 5.39 +/- 0.05 m, equivalent to a diameter of 10.78m (35 ft 4in). Sources: 1. NMRS site no. NG 33 NW 31: 2. Pennant 1790, [5th edn. ), pt. 2, 292 and pl. xxxvii: 3. Chapman, ed., 1970, 64-65: 4. Callender 1921: 5. 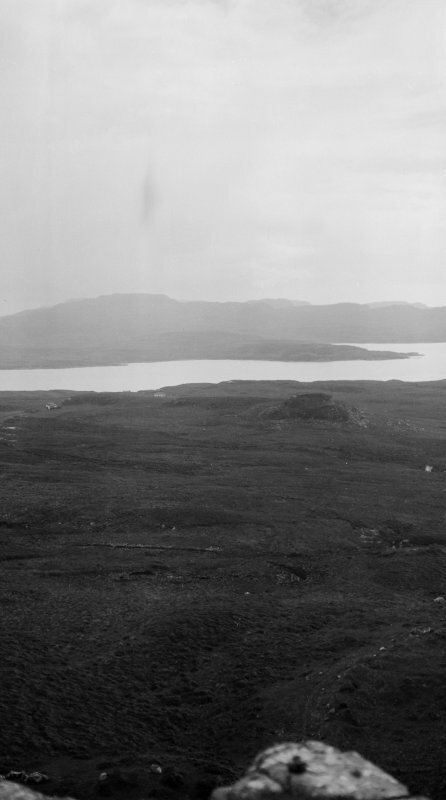 RCAHMS 1920, 142-43, no. 479, and figs. 201-04: 6. 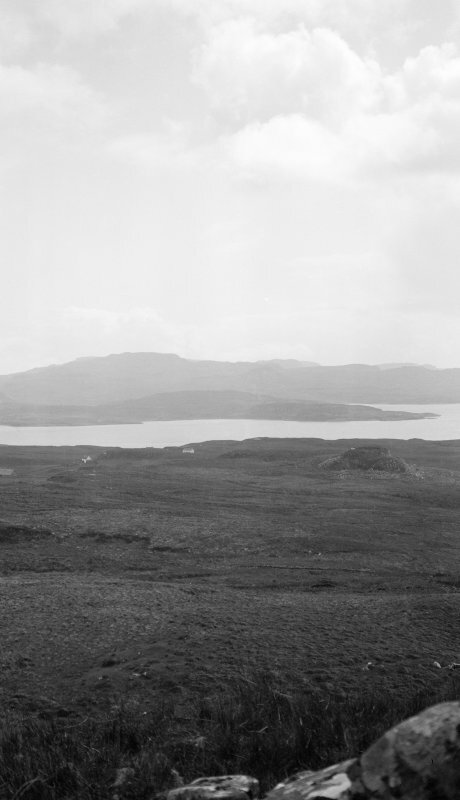 Graham 1947, 97: 7. Young 1962, 188, no. 43: 8. MacSween 1984-85, 41, no. 4 and fig. 4: 9. Swanson 1985 (ms), 880-83 and plan: 10. MacSween 2002. Evidence for later re-use of the broch in the late Viking/Norse period consists of a gold finger ring, bronze stick-pins, an ornamented belt buckle, a coin of Henry II (1154-89), and pottery (Graham-Campbell, James and Batey, Colleen E 1998, 78; illustrated in Callander 1920-21, p. 124). The gold ringer ring is formed from a plain band that tapers to rounded terminals. It is one of three gold finger rings found on Skye (Graham-Campbell 1995).